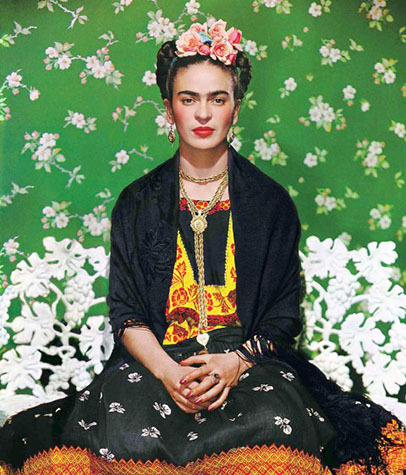 Today is Frida’s Birthday, she has always been a hero of mine and yes, during my high school years I used to pin my hair up and wear floor length skirts in vibrant colours – probably didn’t carry it off as well as she did, especially not when wandering the streets of Hobart, Tasmania – it is a far cry from Coyoacan, Mexico City. Needless to say, I went to both her ‘Blue House’ in Coyoacan and the house she shared with Diego Rivera – joined by a bridge when I lived in Mexico – and was inspired to smoke a cigar atop the Pyramid of the Sun at Teotihuacan after watching the movie. Frida also inspired the pseudonym of a great friend of my family – so I used to receive letters/birthday cards from Frida Kahlo when I was younger!